This place serves some of the best barbecue in the metro area. : All you barbecue wannabes, take notice. Black Hog’s kitchens smoke up some of the best ribs on the East Coast. Your choices: Kansas City wet or Memphis dry, a Black Hog rub that combines crushed peppers, seasonings and sugar granules for a sweet-hot crust on blackened skin covering tender meat. The ribs make for an awesome meal, especially paired with greens, coleslaw and mac ‘n’ cheese. 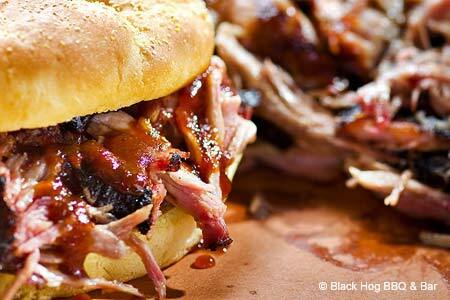 Barbecue sandwiches include brisket, pork, ham or sausage, all with varying seasonings. There’s barbecue grilled chicken, whopping burgers, and three different choices of wings, too, plus goodies for the youngsters. Black Hog is the cousin of a white-tablecloth establishment in town, and affiliated with a fine local bakery, where the restaurant gets its Coca Cola cake and banana cream pie. Also located at Urbana Village Center, Ijamsville, 240-699-0070.